Language: English / Spanish / German Last update 6/1/2013, newly added articles marked in italics. 1. The codices are later copies (after 1200) of classical originals and there can be little doubt that the copyists made mistakes in transcribing the originals (Kelly, 1976). In addition, the texts concern religious and/or astronomical matters and were intended for a small group of "cognoscenti". We can assume that the cognoscenti, the priests, used special terminology which was not known or, at best, little known to the general public. This, in addition to the systematic extirpation of the priesthood during the early colonial period, makes it unlikely that much of this terminology is reflected in the colonial or modern Mayan languages. Moreover, the organization of the texts indicates that they were some sort of catalogue and the information in them was, recorded in a kind of shorthand that does not reflect normal usage. These considerations suggest that using the codices as a basis for deciphering the hieroglyphs would be an exceedingly difficult, if not impossible, undertaking. 2. As Georg Friedrich Grotefend's decipherment of cuneiform demonstrated, it is possible under certain conditions to decipher inscriptions in a language that is not precisely known even if the content is not known. How much easier must, it be then to read the Mayan hieroglyphic texts which were written in a language close to one of the surviving Mayan dialects and whose content is at least partially known? The starting point should be, as Grotefend recognized, with the longest possible inscriptions that contain the names and titles of rulers. Grotefend based his decipherment on Middle Persian, an accessible form of Persian that was much younger than the language of the inscriptions. Similarly, we should be able to take our point of departure from Mayan dialects spoken in the sixteenth century. 3. The previous practice of comparing glyphs independently of the time and location of their inscription must also be rejected since, in addition to varying scribal practices (Kelley, 1976:15), differences arising from time and place are to be expected as is the case with any writing system spread out over more than five-hundred kilometres and almost one-thousand years. For these reasons, this investigation concentrates on the extremely well-conserved inscriptions from Palenque, which have the additional advantage that most of them have been superbly transcribed by L.Schele and are thus easy to read. The Palenque inscriptions also have the advantage that they were recorded within a period of approximately one-hundred years as can be seen from the dates they contain. In the course of the investigation, it became clear that the longest known classical hieroglyphic text from the temple of inscriptions in Palenque is intact and contains information that is unusual as the absence of dates confirms. Beyer (1931) applied a similar method in his investigation of the Chichen Itzà inscriptions unfortunately without notably positive results. 5. The decipherment has to yield grammatically correct sentences with a meaning that makes sense in context. In the case of Palenque, the Yucatec dialect has been taken as the point of departure although some investigators consider Chol/Cholan or some other dialect as more likely (Riese, 1982:256). Yucatec was chosen here because of likely connections between Yucatan and Palenque documented in archaeological details of the architecture, the glyphs and the illustrations at the site. The Cordemex (1980) was with few exceptions the dictionary source for this investigation which helped to avoid problems of different transcription systems in various glossaries (Cordemex: 39a ff). The following grammars were used: Seler (reprint 1960:65ff), Zavala (reprint 1974), Tozzer (reprint 1977) and McQuown (1967). 6. A glyph cannot be considered as deciphered until it has been confirmed in the same transliteration in three different words or interpretations in different sentences with correct grammar and plausible meaning. Unfortunately, only about fifty percent of the signs in the glyph catalogue fulfil this requirement which is at least in part due to the fact that many Mayan concepts are expressed by monosyllables. A somewhat less exacting standard for deciphering a glyph is the confirmation of more than five passages in which transliteration, transcription and meaning correspond. The prerequisite in all cases is an identical transliteration and transcription unless a case of polyphony is involved, which can be explained from the reading of the glyph itself. The conditions for accepting more than one reading for a sign will be explained in the chapter on polyphony. 7. Another prerequisite for the acceptance of a decipherment is the demonstration that there are rules for the writing system. Writing that was engraved on the outer walls of temples and palaces or on pillars in large enclosures has a representational character and should thus be understandable by a fairly extensive audience. This means that the organization and structure of the writing must be easy to understand. Since we are dealing with priests who were capable of making complicated astronomical calculations, it is reasonable to expect logical orthographical rules as well. Knorosov (1967:34-43) also took this or similar considerations as a starting point in his attempt at deciphering the hieroglyphic script, where he, in addition, concentrated on the grammatical aspects of the writing system. These were the basic principles for the decipherment of the stone inscriptions of Palenque. The three-part text of the temple inscriptions with more than 560 cartouches in rectangular or square form, which as a rule form a complete text group (cf. Kelly 1976:14f., where they are called glyger), form the longest known classical text and thus served as the key to the decipherment. Several months of attempts to read the inscriptions using the previously established transcriptions of the glyphs, according to the American school about one-hundred glyphs (Morley i.a. 1984:464) and according to the Tübingen school in Germany about two-hundred (Dütting, 1979:58 ff. ), yielded no results or worse violated the ground rules set out above. If the experts have managed to understand eighty percent of the most often used Mayan glyphs in recent years and, according to the testimony of D. Freidel (Spiegel, 1988, Nr. 30:147), are now able to determine the position of verb, object and subject and are still not capable of transcribing and translating more than one or another sentence in fragmentary fashion - this would seem, beyond a doubt, to indicate that there is something wrong with the results achieved thus far. This conclusion is supported by the fact that even with reconstructed Proto-Chol, which is postulated as the language of the classical inscriptions, no coherent texts can be transcribed and translated. Wolfgang Gockel - from the Introduction to Die Geshichte einer Maya-Dynastie (1984:7-9). 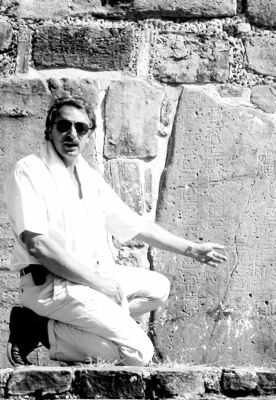 Wolfgang Gockel studied archaeology in Germany. He moved to Finland in 1984 and was active as a freelance archaeologist working on excavations and for museums. He also published a number of books on Latin America and the Middle East (see Bibliography). During spring 1987, when Wolfgang Gockel was working days in the Uffizi Gallery, he spent the evenings puzzling over the Maya hieroglyphs. During my visit to Florence, Wolfgang was very excited and believed that he was on a right track to a decipherment. In June 1988, the German news weekly Stern announced news of his discovery. The scientific proof for the theory was published in the fall of 1988 in the book Die Geschichte einer Maya-Dynastie. Entzifferungen klassischer Maya-Hieroglyphen am Beispiel der Inschriften von Palenque. Wolfgang's theory, a radical departure from both the American and German schools of Mayanology, was not widely accepted. The negative review by Prof. Dr. Bertold Riese in the scientific monthly Spectrum der Wissenschaft (the German edition of Scientific American) (January 1990:130-134) and the reply (August 1990:8) by Dr. Russell Block, one of the referees for the Stern article, show the discrepancy. The first printing of the book sold out quickly, unfortunately it was not possible to arrange for a further printing in German. The book was, however, translated into Spanish and published in 1995 by Editorial Diana in Mexico as Historia de una dinastìa Maya. El desciframiento de los jeroglÃ­ficos mayas de acuerdo con las inscriptiones de Palenque. Wolfgang was quite frustrated about the reactions to his theory. A scheduled conference to be hosted by the Roemer- und Pelizaeus-Museum in Hildesheim, where he would have had the opportunity to present and defend his views was suddenly cancelled and no one from the established community of Mayan scholars seemed interested in even considering his work. Scientific work hardly ever pays the bills and so Wolfgang started writing travel guides. Some new results of his research are to be found in the volumes devoted to Mexico and Guatemala. In the autumn of 2001, Wolfgang was diagnosed with prostate cancer and given two years to live. We decided that he should use more of time he had left for his Maya studies. Wolfgang died on March 3, 2005. His work was left half finished, but, in the end, he was sure that his theory also worked with inscriptions from other Mayan sites (see below). His dream was to write an easily understandable history of Yucatan, but only the scientific version exists. I do not work in the field of Mayanology and can not guarantee that this unfinished material is free from mistakes. I can vouch for Wolfgang's sincerity, love and passion for scientific work and it is in this spirit that I and our sons Arne and Erik Gockel are publishing his material. This first "instalment" includes: the introduction to the Palenque book in German, Spanish and English plus previously unpublished material about Calakmul, Uxmal, Sayil, Sotsil, Xlapak, Kabah, Santa Rosa Ixtampak, Ek'Balam, Tula and Kabah in German. There is a great deal more that will be added as time permits. Die Geschichte einer Maya-Dynastie. Entzifferung klassischer Maya-Hieroglyphen am Beispiel der Inschriften von Palenque.1988 Verlag Philipp von Zabern, Maintz (344 pages). ISBN 3-8053-1031-5. Historia de una dinastìa Maya. El desciframiento de los jeroglÃ­ficos mayas de acuerdo con las inscriptiones de Palenque. Editorial Diana, Mexico 1995 (363 pages) ISBN 968-13-2855-8. Download in pdf format. Syrie, Libanon, Nelles Verlag , München 1998 (1st st Edition) (254 pages). The books has also been translated into English and French. Mexiko. Das zentrale Hochland und Yucatàn-Von den Stätten der Maya und Azteken zu barokken Kirchen und Konventen, DuMont 1998 ( 1st Edition) (364 pages), ISBN 3-7701-4410-4 (3rd Edition; 2005).